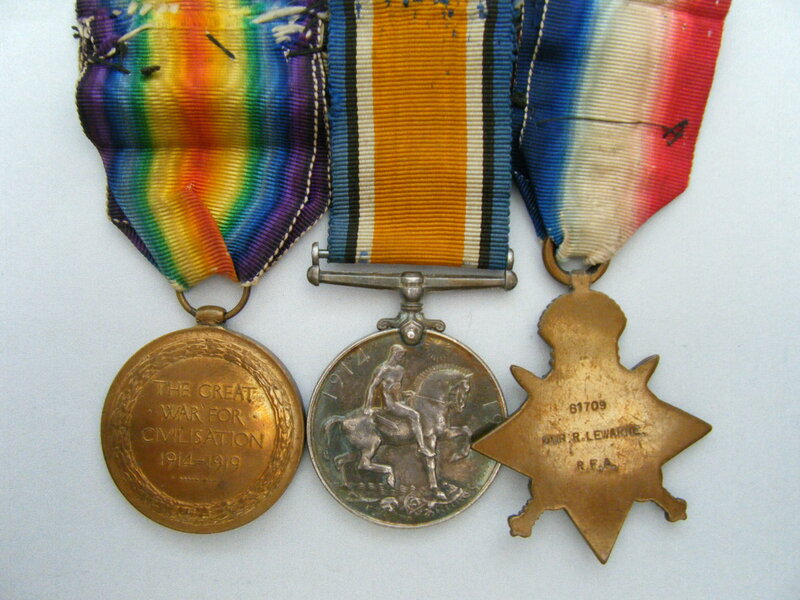 WW1 1914 Mons Star medal group, Royal Field Artillery awarded to 61709 Richard Lewarne. 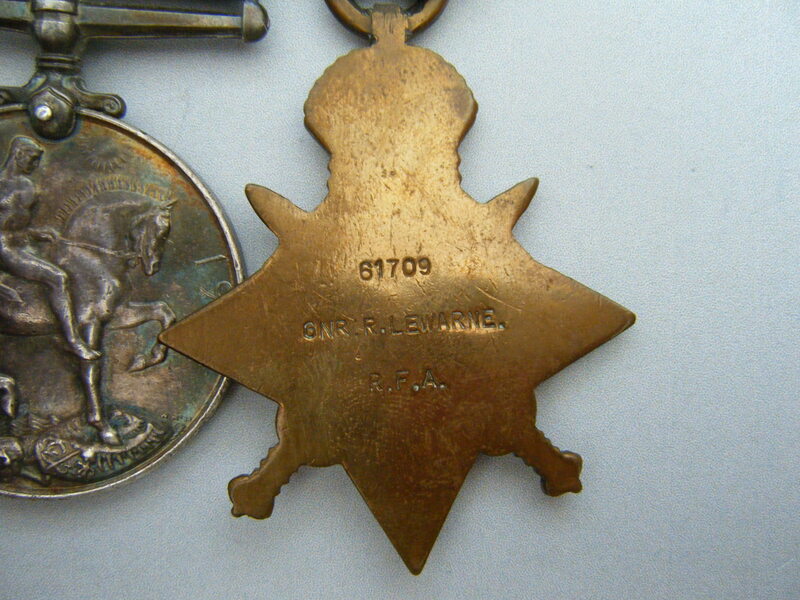 1914 Star (with Mons clasp) named to 61709 GNR R. LEWARNE, R.F.A. 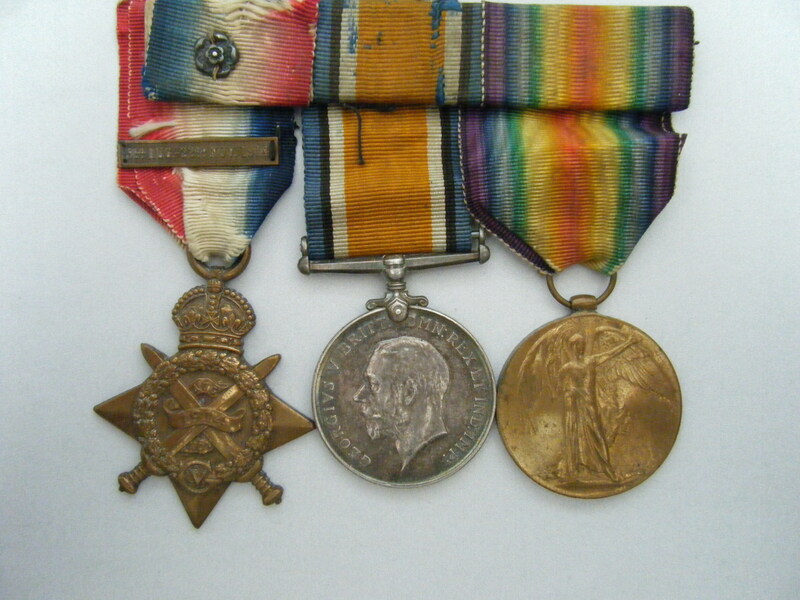 British War Medal and Victory Medal named to 61709 GNR R. LEWARNE, R.A. The medals are partially attached to a ribbon bar containing the roses. Because they are original ribbons they have not been replaced. Included with this listing is a printed copy of the Medal Index Card (which also confirms the clasp and roses) which can also be viewed by clicking on here (if you have access to Ancestry). I have been unable to identify any service records relating to this man. Lewarne served with the 25th Brigade Royal Field Artillery and entered France on the 16th August 1914 serving as a gunner. The brigade was attached to 1st Infantry Division. The Brigade had mobilised In August 1914 and was sent to the Continent with the British Expeditionary Force, where it saw service with the 1st Division throughout the war. During the war the division was involved in the following engagements: Battle of Mons, First Battle of the Marne, First Battle of the Aisne, First Battle of Ypres, Battle of Aubers Ridge, Battle of Loos, Battle of the Somme, Battle of Pozières, Third Battle of Ypres and the Battle of Épehy. The units histories can be viewed by clicking on here and on here. PRICE £275 - please read the terms and conditions below.